Like many young, wide-eyed college kids enjoying the carefree circus known as their freshman year, I joined a fraternity in hopes of meeting fun people and increasing the likelihood of a good time. It was an impulsive dive into the unknown, actually going against my original convictions. But it proved to be an excellent decision. Even today, five years later, I still see my Pike brothers very frequently. 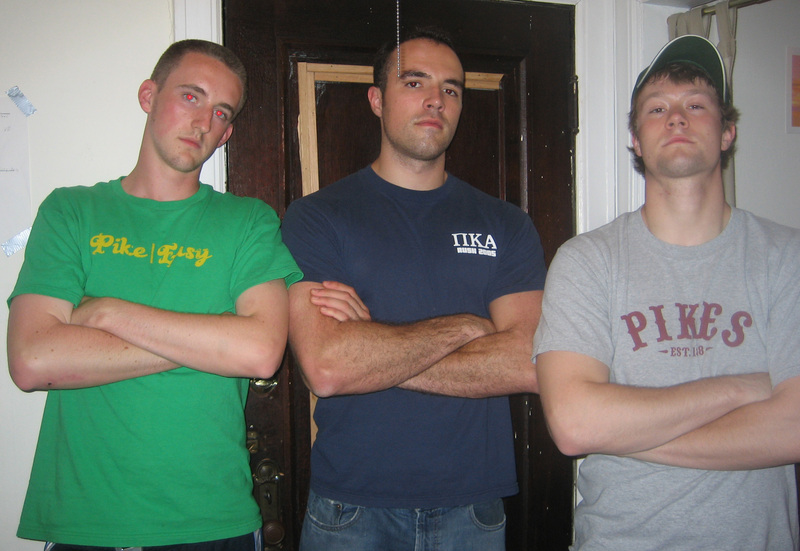 In fact, three of my five post-college years were spent with a Pike as a roommate, Jason being one of those. During one’s sophomore year, you get what most fraternities call a pledge son (some call them “little brothers” or simple “littles”), who is basically a new member that you choose and shape into an acceptable member of society. We had recruited a sizable group of clueless freshmen to join our ranks and I was a bit unsure as to how to go about deciding who I wanted to mentor and occasionally spoil. Our chapter was fond of renting a bus and road-tripping out to nearby Big Ten schools for Away football games – not only was it a fun trip, but it was also a great opportunity to see how well these newcomers meshed with the rest of the upper classmen. After one of these trips, I went to Sargent dining hall with two freshmen named Nick and Jason. Jason was a quiet, white bread kid from a nearby suburb. I honestly didn’t learn much from him in that session and whatever I did I must have forgotten (sorry dude). However, Nick stood out more because he looked like he was still in high school. He had spiked, gelled hair, a graphic T-shirt and a beaded necklace characteristic of most counter-culture hoodlums who change their hair color every summer. I wouldn’t have been shocked if his wallet came with a chain attached to it. But at some point he mentioned that he liked Killswitch Engage and that was good enough for me. Later that year, he would end up joining Pike and becoming my pledge son. Over the next three years, we shared many fun times, including concerts, video game marathons, leadership positions within Pike and trips to both Costa Rica and Maryland, where I met his extremely doting parents who to this day still call me when they’re in town. Jason, who also joined Pike, became his roommate and close confidante for the next three years. After graduating, Jason stayed in Chicago while Nick was accepted to GE’s Edison Engineering Development Program, a rotational program that took him to Texas, Georgia and finally Greenville, South Carolina. Though he had visited us many times since, we had never made the trip to his constantly rotating neck of the woods until this past weekend. 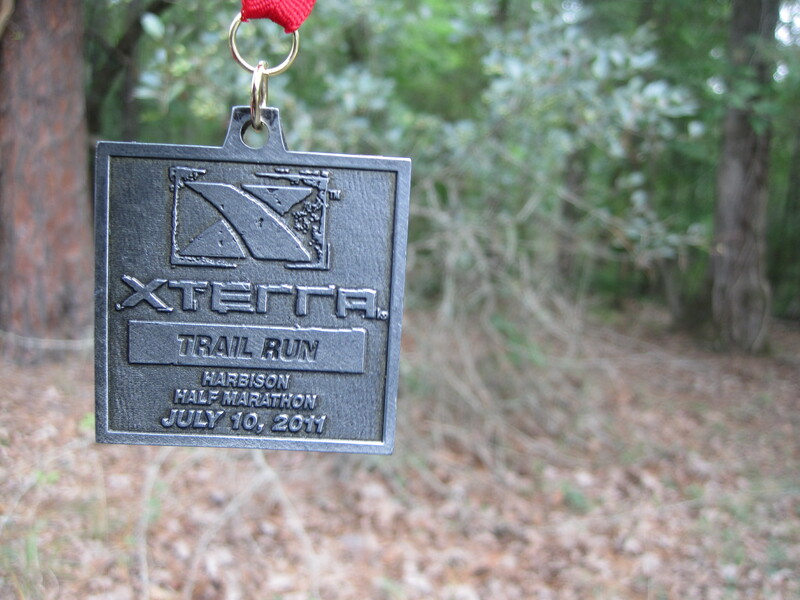 I found the XTERRA Trail Run, a trail half marathon in Columbia, South Carolina, a few hours away from Greenville and a trip was planned. After a last-minute 3-hour delay, we landed in swampy South Carolina around midnight on Friday. We met up with Nick at his apartment and had a few beers while catching up with each other. 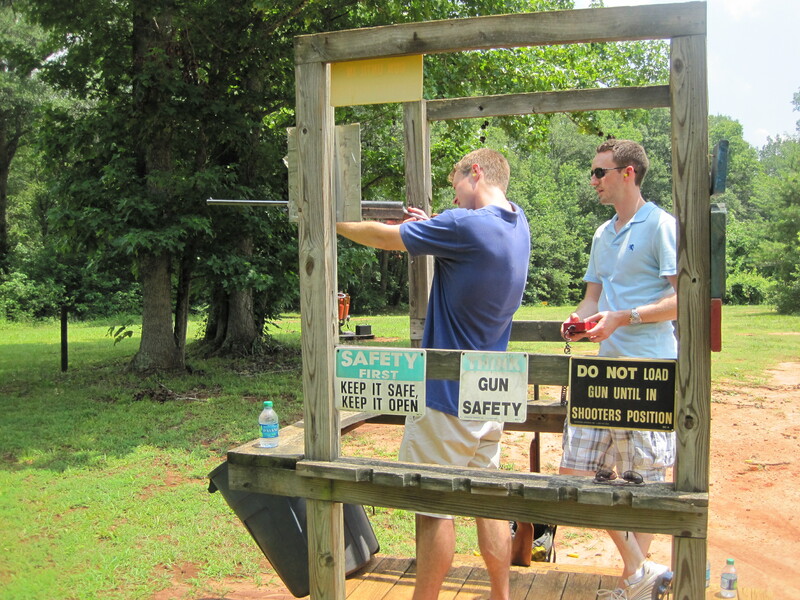 The next day, we went out to the River Bend Sportsman’s Resort to shoot sporting clays with Nick’s shotguns. This, apparently, is what happens when a liberal kid from DC moves to the south. It was a first for both me and Jason as neither of us had ever fired a weapon before. Of the 40 or so orange discs that were hurled into the wilderness, we each hit about 7 or 8, while Nick’s more experienced marksmanship earned him easily more than twice our combined kills. Note to self: if you ever break into Nick’s apartment, he has the skills and weaponry to shoot you, even if you’re the size of a dinner plate and flying through the air. Actually, no. As humid as San José is, it rests high at 4,000 feet, which keeps temperatures well below 90, even during the dry season. Ironically, I should be used to heat and humidity from the twelve years I spent in Georgia … but I wasn’t an endurance athlete then. I wasn’t any kind of athlete then, I was a skinny kid with a Super Nintendo and a 14.4 Mbps internet connection. But I knew what I was getting myself into. 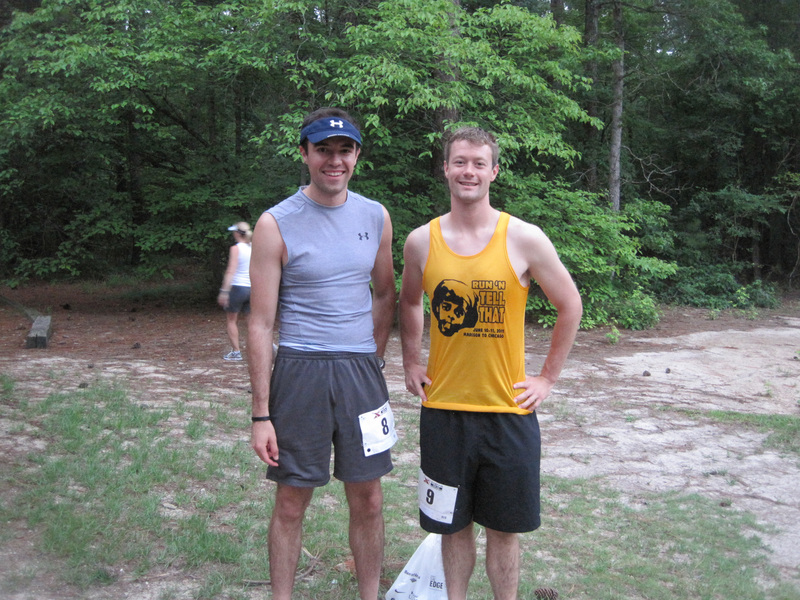 A trail half marathon in South Carolina in July was bound to be a challenge and I was feeling adventurous. 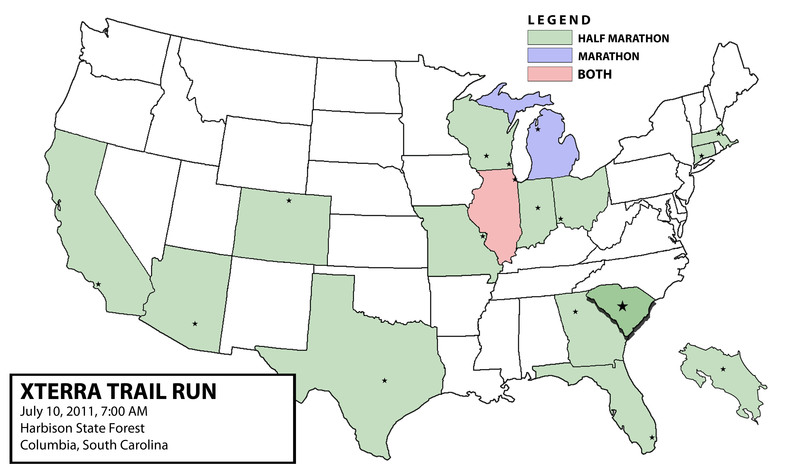 There are only so many flat road races that you can run before you want to try something new. Plus, I had been hearing a lot about my friend Jay’s adventure racing in Colorado and it further motivated me to hit the trails. I wasn’t at all prepared and hadn’t done any runs hotter than 82 degrees, but … well, where’s the adventure if you’ve covered every angle? My first impression of the race start met my expectations. It took place on a gravel road, flanked by parked cars. 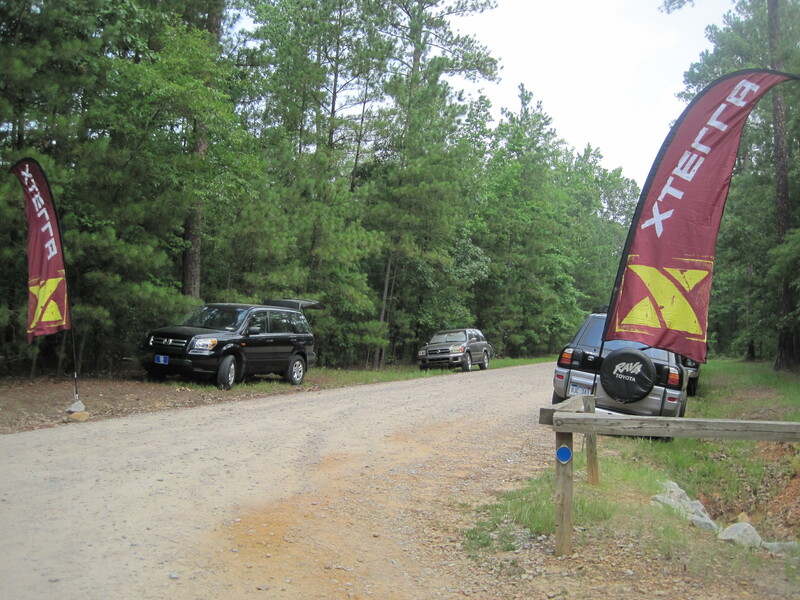 There was no large banner or start mats, but instead two maroon XTERRA flags and a few volunteers with a microphone. The rest of the setup was similarly austere, with only a rope stand designating the finish line in a park clearing about a hundred feet away. I really enjoyed the simplicity of it all, a stark contrast to the flashy lights of most large road races (though we all know I love those too). Can we look any goofier? Also, check out those elite numbers. The field was considerably smaller than my average race, with about four hundred people lining up behind the flags. In addition to the half marathon, there were several runners participating in the event’s 5K race, which would start shortly afterward. But by the time the race director took the microphone to deliver the typical pre-race announcements, the start was fifteen minutes late and amid the nervous chatter of race participants, the day grew steadily warmer. That gravel road was as paved and as wide as the course got. Not two minutes into the race, runners left the main path and cut into the woods, where for the next four miles we would run like ants in a single-file line. The air was still and the woods were thick, the path as narrow as two shoulder widths. Everyone kept an easy pace, focusing more on rocks, exposed roots and slippery sand than on their split times. Taller people like yours truly also had to watch for branches and leaf whiplash – our registration goodie bag also came with ointment to treat poison ivy, which wasn’t very reassuring. I couldn’t see the path ahead for more than twenty feet because I was too busy turning, watching my feet and looking out for other racers. Passing people (or getting passed) only happened when there was enough room for someone to scuttle ahead – it felt like passing cars on a two lane highway. The first five miles or so went by very slowly. I was keeping a very conservative pace (around 10:30 min/mile) to preemptively avoid heat exhaustion. Despite this, I was drinking more water than usual. 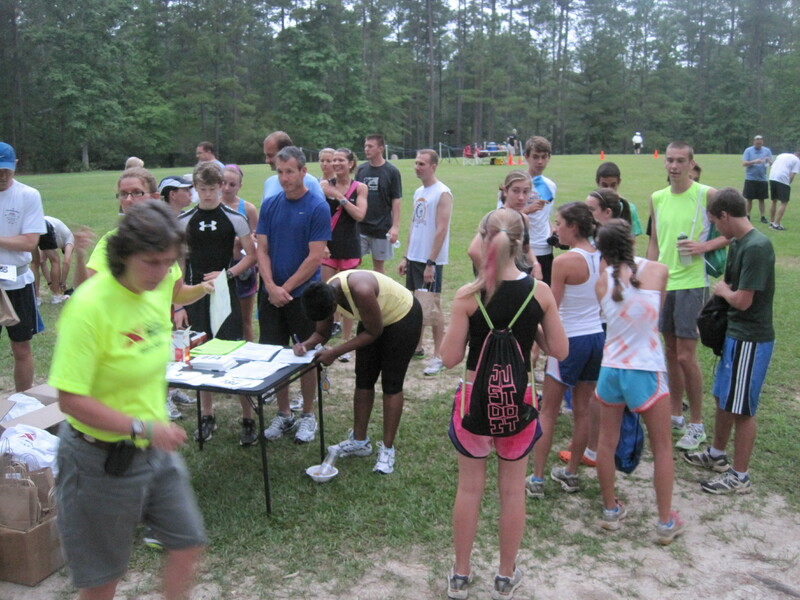 The organizers had provided five aid stations but highly encouraged runners to bring their own water. The combination of my slow pace and frequent hydration was keeping me relatively stable, but by mile 6 I was so sweaty that I could feel it in my shorts. With the 90% humidity and lack of wind, sweat doesn’t evaporate and the body’s cooling mechanism falls out of sync. It wasn’t long before the water in the air began to affect me. There was also the pesky problem that Jason had taken off ahead and I was no longer closing in on him. By the time I reached the aid station at mile 8, I decided I had to stop and rest. I could hear my feet splashing in my shoes and every step sent droplets of sweat from my shirt and visor to the swampy dirty below. The volunteer urged me to eat an orange slice to get my blood sugar up and I must say, it was the best tasting orange I’ve ever had. After I washed it down with iced Gatorade, I felt reinvigorated and continued running. The next mile was easier than the last three, which had mostly consisted of sharp uphills combined with perilous downhills. However, upon reaching mile 9 I reached a section of park that was a less flush with vegetation, as if on the edge of a housing development. Here, the course gently sloped upwards for a long time, sapping the rest of my energy. There was no one with whom I could commiserate as the field had been stretched very thin. I could feel a lump in my throat rising, my breathing pumping out warmness into the damp air that with every step weighed more heavily on me. What I was doing was no longer considered “running.” I was shuffling uphill and falling controllably downhill. Even the rare straightaway was a challenge. But I couldn’t let myself dwell too much on how arduous it was to keep going – I still had three miles left to go. During the earlier stages of the race, I saw two people fall. One was a girl who was probably in her mid-20’s, who tripped to the side of the trail into a pillowy tuft of grass. She shook it off, waved away the runners who offered to help her up, and kept running without any visible problems. Another runner was a shirtless man who looked to be in his 50’s. I didn’t see him fall, but watched him slowly get up and take a few steps on perfectly stiff legs. He too dismissed concerned runners and decided to continue the trail on his own (he would pass me a few miles later, so I wasn’t too worried). After mile 12, I had my own run-in with gravity. At this point, I was so tired that I was barely lifting my legs off the ground. In one of these sluggish steps, my right foot clipped a root and I was sent flying forward, my arms circling like windmills and my legs suddenly faster than lightning, doubling their efforts to keep me from falling on my face. I managed to not fall down, but definitely lost all my composure with a very loud “Whooooa!” echoing through the woods. Gravity would have its second shot at me just a half mile later. As if I had learned nothing, my stride was stopped dead in its tracks by déjà vu and I lost my balance. This time, my legs did not obey my survival instincts and instead locked themselves into place, sending me falling like a heaving, sweaty tree. 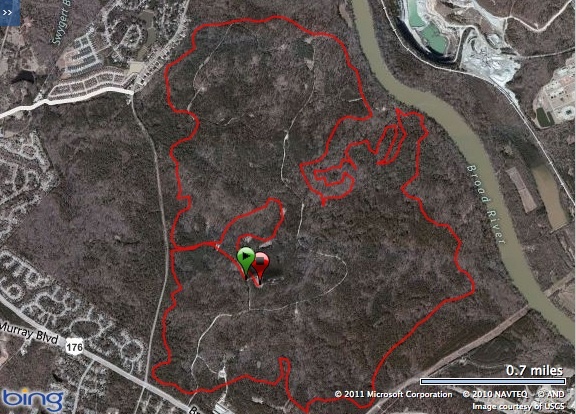 Miraculously, I ended up with no scratches – just a lot of dirt on the right side of my body and a cramp in my shoulder. Following in the footsteps of those before me, I stubbornly waved away the runner who had offered to help me up, and kept my laughably slow pace until I could hear the thin crowds of the finish line. Once I saw the parked cars from the morning, I managed to increase my pace to a respectable speed with a combination of pride and magic. As of this writing, I don’t know my official finishing time, but it was somewhere in the realm of 2 hours and 35 minutes, almost a full hour slower than my half marathon PR. When finished, Jason and I shared war stories in the pavilion by the finish line. I must congratulate him here, for it was the first time he’s ever beaten me in a race, and by a large margin. We had reason to be proud: at the finish line, a slender, athletic girl boasted to a nearby runner that she had competed in several half Ironman triathlons … and this had been her toughest race by far. But neither one of us could celebrate having conquered our first trail half marathon because we were so visibly weathered and beaten. I did everything I could to cool myself down but nothing was working. I doused my head in cold water, drank from the Gatorade cooler until I was practically eating the mix, ate four orange slices and later force-fed myself a couple of pretzels. I was no longer running, so where was the relief, the pride, the pleasant and gradual return to homeostasis? Even in hot races, I had found that right after the finish line, no matter how torturous the course or hellish the weather, I could cool down and reach a comfortable condition and just relax. But not here – it wasn’t until we had cranked the car’s AC to a glacial storm that we finally felt alright with the world. After showering and meeting up with Nick at the hotel in Columbia, we drove to DiPrato’s, a nearby restaurant by University of South Carolina’s campus for brunch. 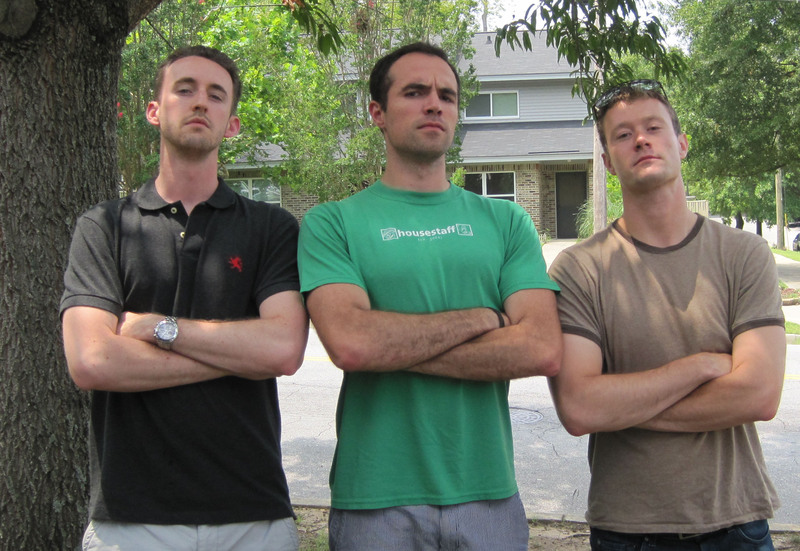 With the crowds of seersucker-clad southerners in their golden years, we stuck out as the only young men in their mid-to-late 20’s wearing t-shirts. Once the bill was paid we realized that we had to floor it back to Greenville to make our flight. Three hours later, Jason and I were flying back to Chicago, happy to have spent a great weekend with a good friend, old memories, new jokes, firearms and a scorching half. I would run another trail race, easily. I liked the challenge and the feeling of running through a hiking trail with nothing but tiny flags pointing the way. However, next time, I’m choosing one in April. In Wisconsin. Hey! I live in Columbia and was thinking about using this race for my July race. Its the only race anywhere near here that isnt already sold out. Would you recommend it to someone? It sounds like it was fun and challenging. Hmm … good question. This is the only major trail race I’ve ever done and it manhandled me. If you’re aching to race and you’re used to the heat and humidity, then sure, sign up! If not, bring your own water bottle and pace yourself. “I would run another trail race, easily. I liked the challenge and the feeling of running through a hiking trail with nothing but tiny flags pointing the way. However, next time, I’m choosing one in April. In Wisconsin.” Hmmmmmnnnnn…..
Come do XTERRA in July!! I think im going to do it this year since last year I had to bow out.